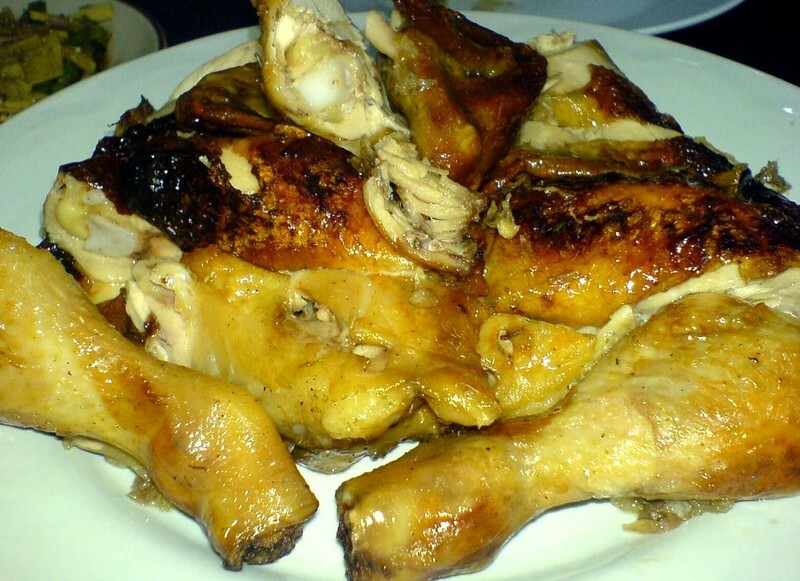 EatingAsia: World's Most Glorious Grilled Chicken? World's Most Glorious Grilled Chicken? Within two months of moving to Bangkok, we'd settled into a Friday night routine. After walking the dog up and down our noisy litle soi, we toasted the end of the week with a pop or two in front of a half an hour of Jamie Oliver on UBC Series (yes, I agree, the ever-perky Mr. Oliver can be a bit annoying - but there's no denying that the man knows his food). Drinks drained and appetites stoked, we'd amble up the soi to the main road and hop in a taxi, bound for one of the most humble of Thailand's myriad culinary pleasures - gai yang (grilled chicken). Our gai yang purveyor of choice was one of two side-by-side eateries on Narathiwat Road, the establishment closest to Sathorn Road (I'd love to recommend it here, but a visit last year found that ownership had changed hands and standards had dropped.). I suppose you could call it an indoor-outdoor eatery, since three quarters of the tables were protected from the elements by slabs of sheet metal, while those dedicated to al fresco dining were lined up curbside. Cooking facilities consisted of two charcoal grills - fashioned from halved steel barrels - that turned over a steady supply of whole burnished birds, salt-crusted whole fish, crispy pork neck, and charred beef strips (the latter two for yam - salads), and a wok-and-prep area for yam assembly and stir-fry. Arriving at this gai yang hotpsot on a Friday night around 8 o'clock was like joining a big party. All but a few tables were filled to capacity, and most customers - casually dressed families, couples on dates, big groups of coworkers sporting office wear that became increasingly disheveled as the night wore on - were well into leisurely dinners accompanied by big bottles of Chang beer and glasses of Thai whiskey and soda. An unchanging cast of hopeful soi dogs wandered among the tables, unaggressively seeking leftovers. Bouncy waitresses in Heineken or Chang or Carlsberg promotional gear smilingly solicited orders and proffered food and refreshments within minutes. For us this place, oozing cheer and fellow feeling, utterly relaxing in spite of its situation next to a busy eight-lane road, was the only place to mark the start of a weekend. Oh, did I mention that the food was fantastic? I'm going to go out on a limb here and assert that nobody, but nobody, does grilled chicken as well as Thais do. I think it's in their blood. 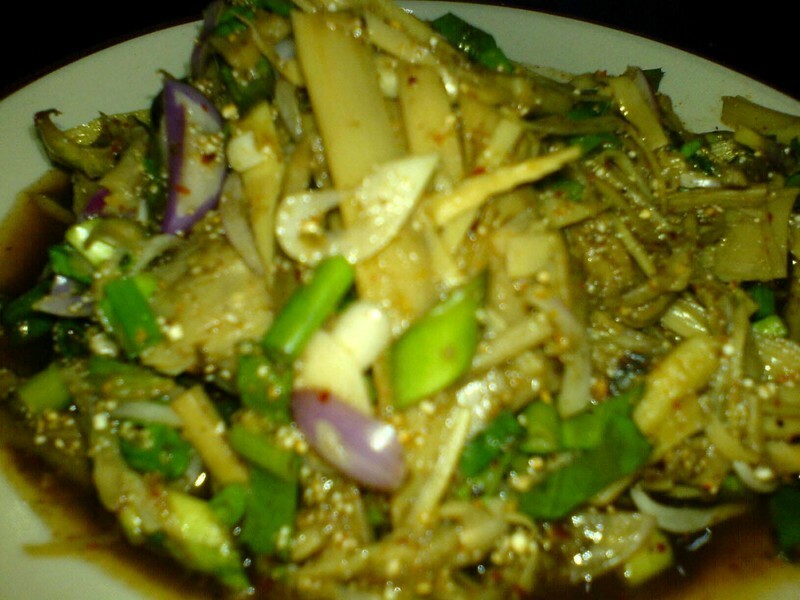 The simplest of dishes, yet one of the most difficult to execute flawlessly, gai yang - originally an Isaan dish - is abundantly available on the streets of any city or town in Thailand. Lightly marinated, expertly grilled, browned-and-crispy-skin-tender-and-juicy-meat barbequed chicken. And the dipping sauce! With sentimental memories of BBQ Chicken Fridays dancing in our heads, it was only natural that our first meal in Chiang Mai be grilled bird. 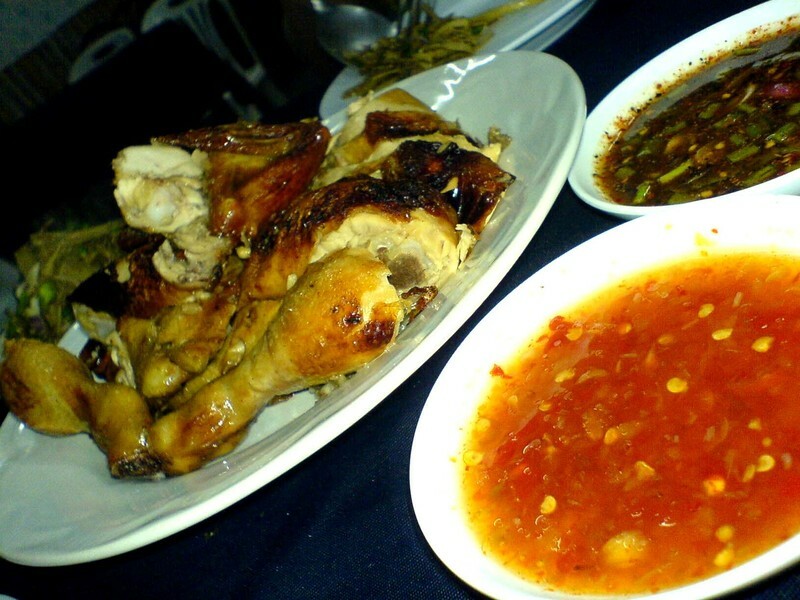 In response to our request for an intro to the "best grilled chicken in Chiang Mai" the owner of our guest house sent us to a quiet moatside street on the outer edge of the Old City. There's no sign and the place is a bit hard to find, he told us. "Just look for the rotating chickens on spits." When we arrived, close to 9pm, the shop appeared perilously close to shutting for the night; only two lonely chickens twirled above the coals. We snagged one and grabbed a table, preparing to pass judgment. I'm not sure that this mobile phone photo can do the bird justice. It was heavenly, perfect, just what we'd been dreaming of since our last visit to this country of uber-talented chicken grillers. I've never been a fan of the sweet dipping sauce (nam cim waan) lower right, but it's always proffered to foreigners, Thai-speaking or not. It's worth asking for a saucer of brick-red, spicy-sour-garlicky nam cim phet (above right); the more asssertive flavors are a made-in-heaven match to the bird's char. This shopfront, like most any grilled chicken hut in Thailand, offers Isaan-origin sides: rice both plain and sticky; nya nam tok (rare grilled beef salad); somtam (sour and spicy green papaya salad), Thai-style with dried shrimp or Isaan-style with pounded pickled crab; and sup nawmai (a "wet" salad of boiled bamboo shoots, coriander, mint, and shallots dressed with chilies, lime, and pungent fermented fish sauce - pla raa). The latter is one of my favorites, and this version skillfully walked the fine line between full-flavored and fishy to the point of funk. It also boasted plenty of ground toasted rice (the whitish bits barely visible in the abysmally blurry shot below), an ingredient absolutely essential to a good sup nawmai. What a way to start a holiday! The only way to follow up a meal like this? 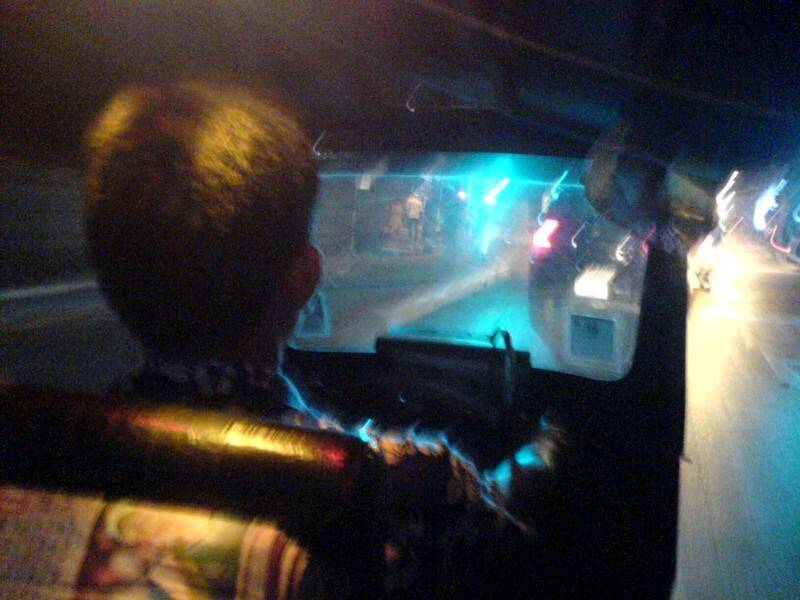 A rollicking tuk-tuk ride back to our temporary digs (top photo). Gai yang shop, Thanon Sri Poom between Moon Muang and Ratchaphakinai streets. Inside the moat, Chiang Mai Old City. If you're on Thanon Sri Poom at the corner of Moon Muang and heading towards the Chang Puak gate, you'll pass one soi (alley) on your left before reaching the shop. If you hit a second soi you've gone too far. Keep any eye out for the spit, at the front of the shop but a bit tucked in, away from view. That chicken does look superb! Marcus, thanks for stopping in. Glad you're enjoying the blog -- is KL your hometown? CW, it tasted even better than it looks! it looks absolutely delicious. makes me want to dash off to Bangkok's Sathorn Road right now!